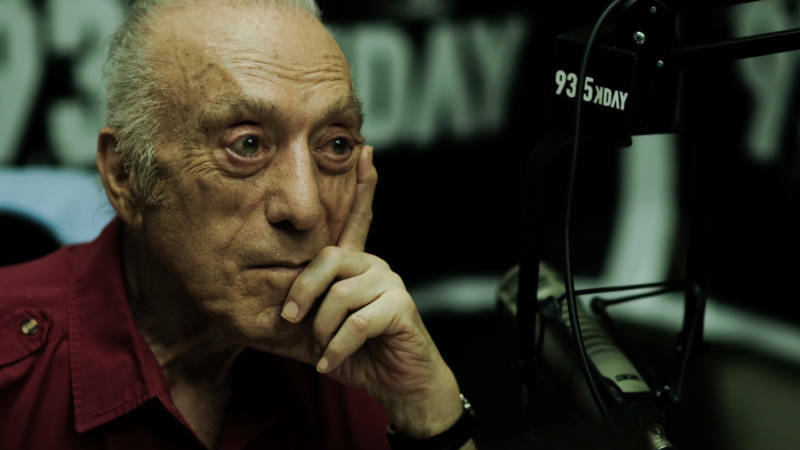 never knew who Art Laboe was, or what he meant to so many Californians, until I moved to Fresno, and started dating someone who grew up on Laboe's music. We would drive on country roads lined with orange groves and tune into Laboe's Sunday radio show, where people from all over the state would send in lovey-dovey dedications to each other. And then there was Laboe's signature on-air smooch into the microphone. My now-husband Karl was a low-rider growing up, cruising in his Nissan mini-truck with tinted windows, custom-painted graphics on the side and a booming stereo. He would blast Laboe's show, which played songs by artists like Rick James, Teena Marie, Tierra and the Temptations — from the 12-inch woofers, while waxing his car and cleaning the custom spoke wheels with a toothbrush. By the time I met Karl, he had moved away from the low-rider lifestyle, but not Art Laboe, or the love songs. He's one of generations of Californians — especially Chicanos and Latinx folks — who've grown up on Laboe's music, first listening as their grandparents did. After all, Laboe has been spinning oldies and love songs since 1943. 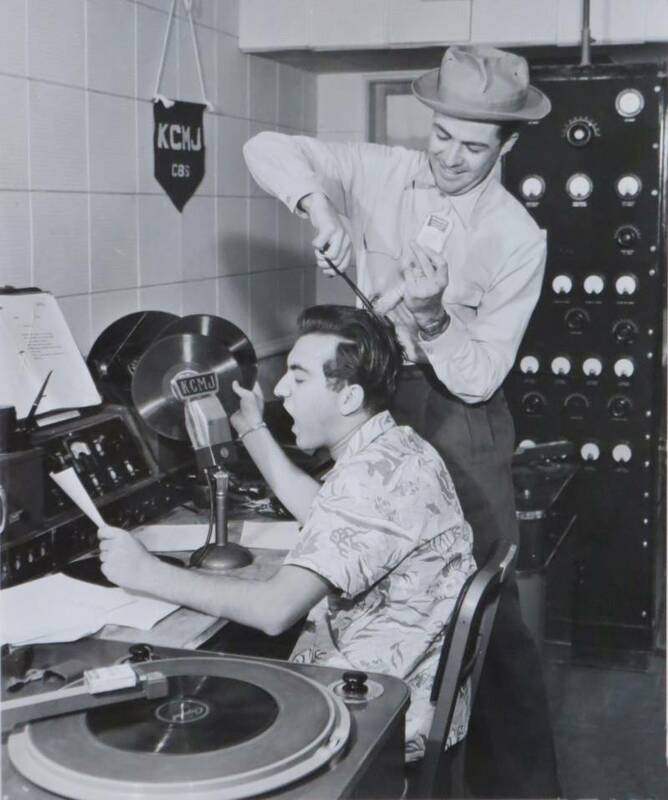 He coined the term “oldies but goodies” and was one of the first DJs on the West Coast to play rock 'n' roll. 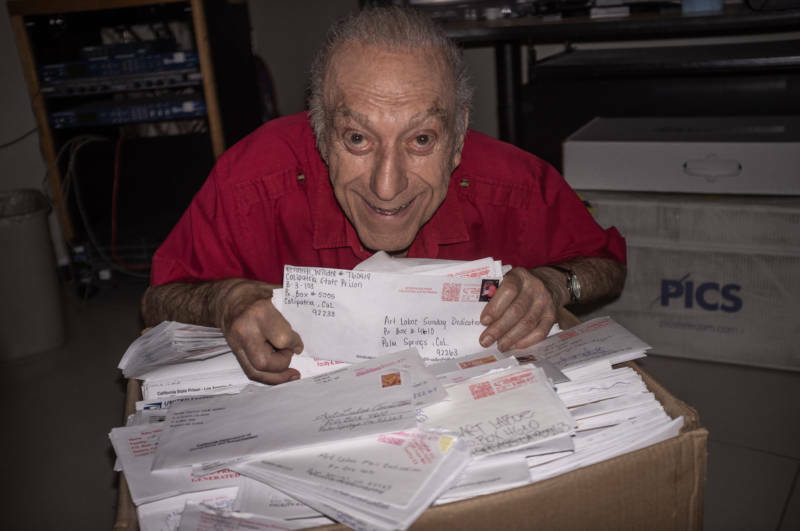 He still takes to the airwaves from a Palm Springs studio six nights a week from 7 p.m. to midnight, hosting The Art Laboe Connection — a show broadcast on more than a dozen stations across California. Laboe spends hours every day playing songs that are about the heart. “Love is a powerful medicine, whether you’re falling in love, or out of love,” he says. These days, many of those calling in with regular dedications have loved ones in prison. "He's just an amazing DJ. 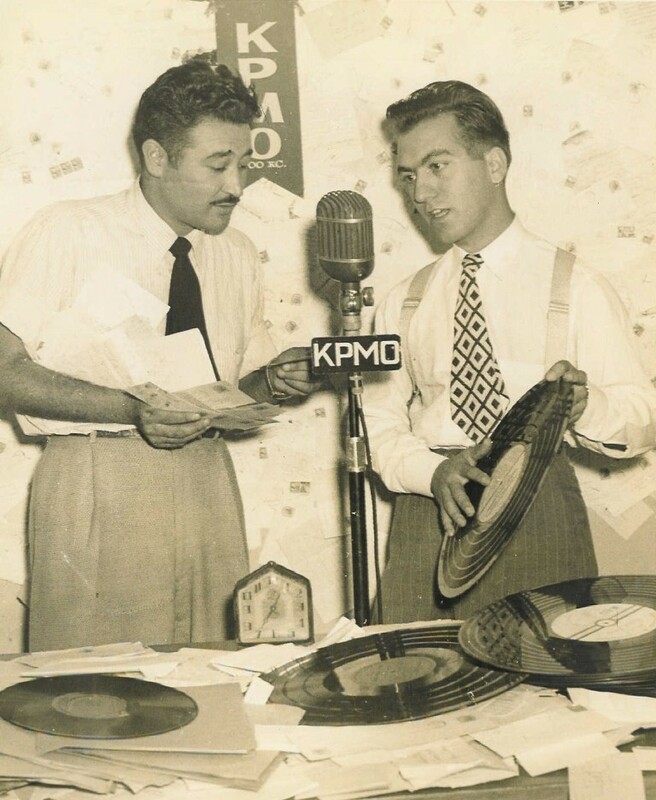 I would listen to him until my last breath," says longtime listener Rosie Morales, of Sylmar. She calls in every single day with a dedication to her husband Scrappy, who's serving a life sentence in Kern Valley State Prison in Delano. She can't call her husband directly right now, because he's in solitary confinement. But she can hear Laboe smooch kisses sent by her husband into his microphone. "He's able to communicate to our loved ones when we can't," Morales says. "He brings that spark into relationships." “They’re there, man and wife, every night, man and wife, doing it to each other, dedications," Laboe laughs. "Conjugal, but not conjugal." Some prisoners send in a week's worth of dedications to their spouses or lovers, with a different love song for each day of the week. "Art’s so concerned about the prisoners, because for every person that's inside there can be 10 or 20 family members on the outside affected by that person being in jail," says his longtime audio engineer, Joanna Morones, who answers phones to take dedications. "He really caters to that family dynamic, you know, and connecting them. We're told every night, ‘I can't go visit him. I won't be able to go see him for two weeks, but I can talk to him on the radio.’ The guys in prison sit there and wait to hear their wives’ voice on the radio," Morones says. 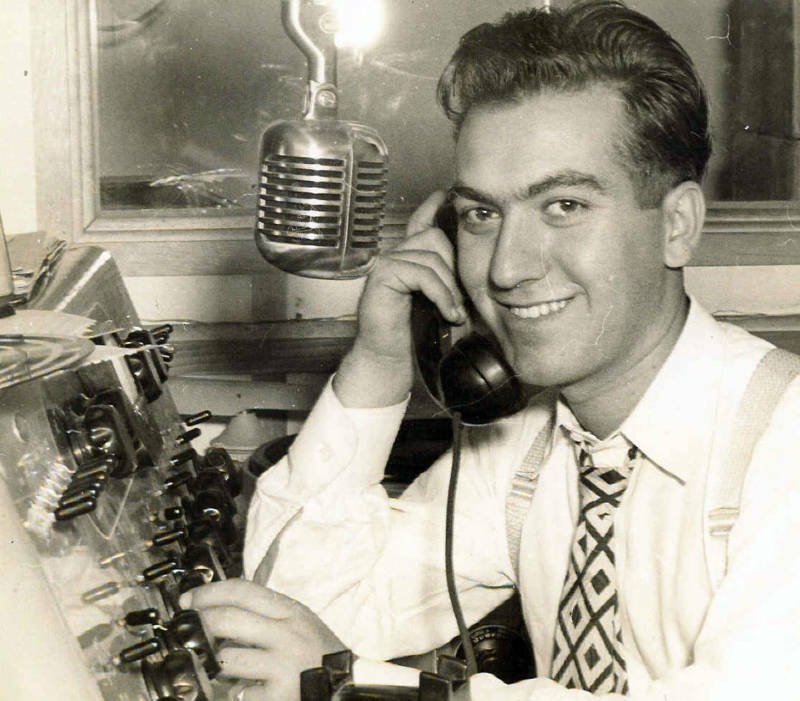 Laboe's obsession with radio started when he was eight years old, when his sister sent his parents what he called "this box that talked." He set up a ham radio station in his bedroom at age 14, broadcasting to his neighbors. When he was 18, he walked into radio station KSAN in San Francisco and asked for a job. He had no real experience, and he hadn’t yet honed his rich baritone. But he did have one thing: a radio operator’s license. The station had lost its engineers to the draft — this was World War II. The manager offered him a job on the spot. As long as he changed his last name, which the manager thought sounded "too ethnic" for the airwaves in 1943. 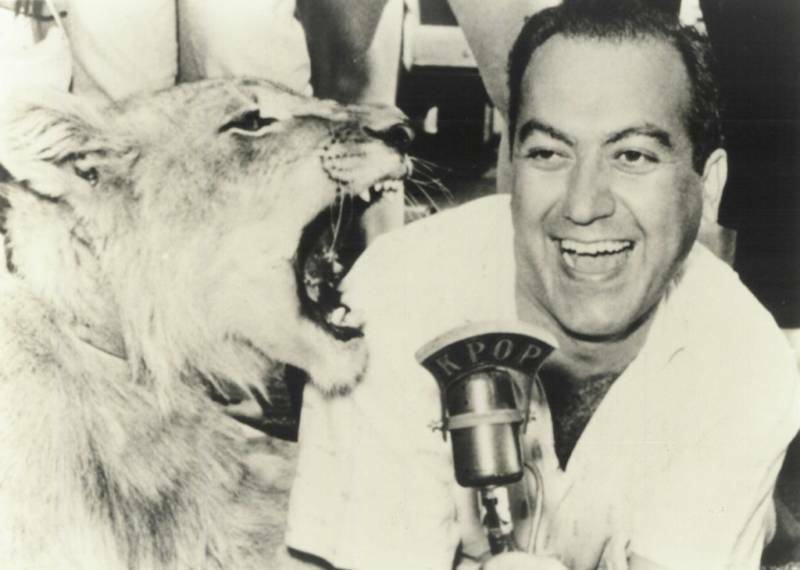 So Art Egnoian — the son of Armenian immigrants — took the name of the station’s receptionist and became Art Laboe. But his music, and his fan base, have never been whitewashed. Laboe has built a huge fan base, starting with the teenagers who attended his live concerts or dances back in the 1950s. He made a name for himself hosting rock 'n' roll concerts in the Los Angeles suburb of El Monte, pioneering racially integrated, all-ages dance parties with live bands. "I can do some nice talking in Armenian. But I can do almost that good in Spanish, too," Laboe smiles. "I’m happy that [our concerts and shows appeal to] everybody. If you come to one of our concerts, you’ll see a mixture, a complete mixture of what we have in California." At 93, Laboe is still hosting live shows across California and the west, wearing his signature bedazzled track suit and a sparkly bowler hat. Laboe says he knows people his age always say this kind of thing, but he is nostalgic for the old days — a time when people used to have a little more kindness for each other. “It would be good if we had a little bit more of what we used to have in the world," Laboe says. "Nevertheless, people are people and they still have the same basic wants and needs. Everyone is capable of love and affection, if they could just have a little bit more of it for each other."